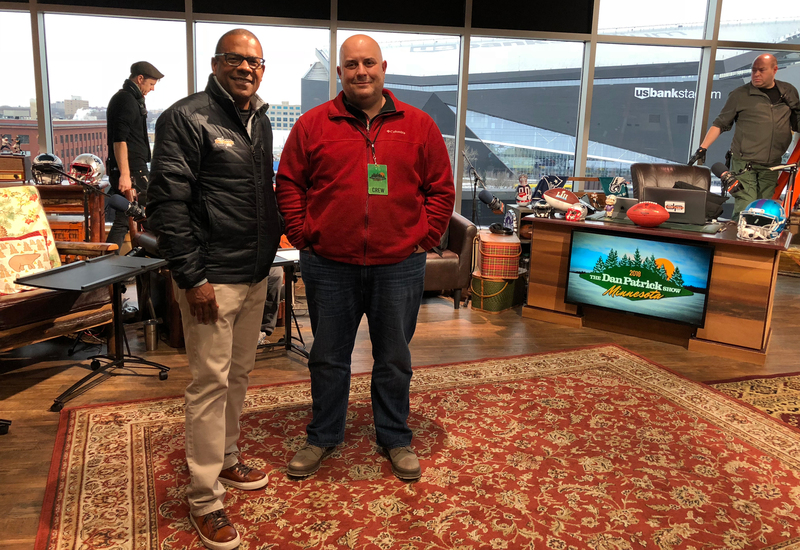 If you are hunting for the best view in the Twin Cities this week, look no further than the backdrop that AT&T Entertainment Group has found for its sets for the live broadcasts of both The Dan Patrick Show and The Rich Eisen Show airing on DirecTV’s Audience Network. 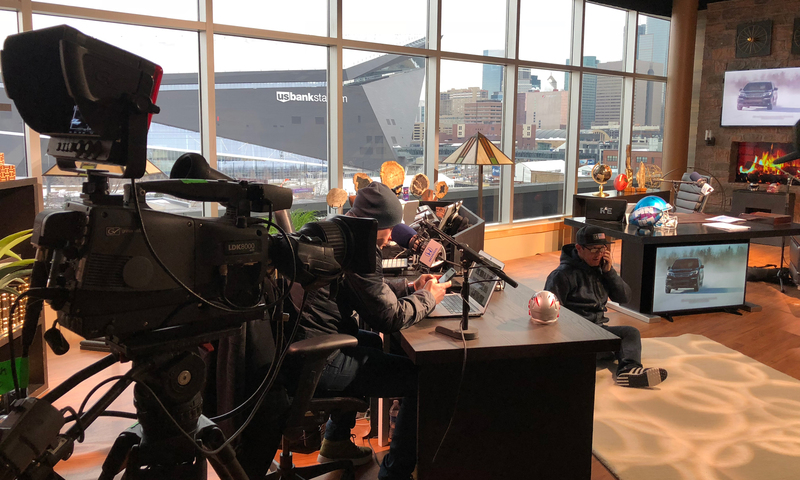 For its onsite Super Bowl coverage, the media company rented out a recreation room of a new loft building just blocks north of U.S. Bank Stadium, giving the dual sets a special view of the stadium and the Downtown Minneapolis skyline. Set designer Dave Edwards has been conceiving impressive set designs for the network’s Super Bowl coverage for many years. Some of them — as was the case in New York City, New Orleans, and Phoenix — were full structures built from the ground up. In Minneapolis, he made the most of a small space, creating a pair of side-by-sides separated by a wall and featuring different flavors tailored to the personalities of the hosts. The Dan Patrick Show’s set takes up half the rented condo space that gives two shows a spectacular backdrop showcasing U.S. Bank Stadium. The two sets share a total of nine cameras. A jib outside in an open-air section of the penthouse level grabs sweeping views of the stadium across the street, and a Steadicam flips from one set to the other. A dual-feed Mobile TV Group truck is fully producing the show onsite and allows the two show’s crews to work simultaneously. The shared resources make for a streamlined effort. The Dan Patrick Show airs live from 9 a.m. to noon ET on AT&T Audience Network, available on DirecTV and DirecTV NOW. It is also simulcast on NBCSN. The Rich Eisen Show airs live from noon to 3:00 p.m. on AT&T Audience Network, available on DirecTV and DirecTV NOW.